RIO DE JANEIRO, BRAZIL – The seventh edition of Live Cinema begins on Saturday, October 4th and will run through Sunday, October 12th. The free to the public festival will feature ten artists/groups presenting live audiovisual performances and lectures at four venues; Oi Futuro Ipanema, Biblioteca Parque Estadual, Biblioteca Pública de Niterói and Praça Agripino Grieco in Méier. Multidisciplinary performance group, Coletivo Plástico Preto, will present their installation entitled, ” _00007″ on both October 4th and 5th at Oi Futuro Ipanema, photo by Jonas Bueno, courtesy of Live Cinema. “Live Cinema is audiovisual performance in real time i.e., the artists manipulate images, sounds and data at the time of the public exhibition of their work,” Live Cinema curator, Marcia Derraik explained in a prepared statement. 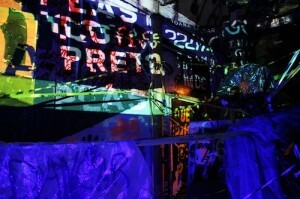 Derraik, a documentary filmmaker, created Live Cinema in 2007, with multimedia artist Luiz Duva. 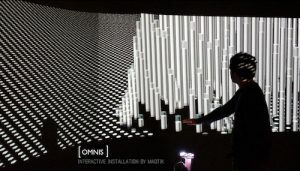 French artist, Maotik will make his Brazilian debut during the festival, presenting his installation entitled, “Omnis,” on both October 4th and 5th at Oi Futuro Ipanema, photo courtesy of Live Cinema. On October 9th at Biblioteca Pública de Niterói,filmmaker Bruno Vianna will present the lecture, “Live Cinema – Concepts and Trends.” A visual workshop with VJ Robson Victor will follow. The Biblioteca Pública de Niterói then will host Dino Vicente and VJ Robson Victor (together known as 2Vic) and their presentation of “O Que o Mundo Contém?” on the 11th. Finally to close out the festival, Uaná System, a group consisting of multimedia artist Luan Rodrigues and DJ Waldo Squash, will perform live at Praça Agripino Grieco in Méier, a neighborhood located in Rio’s North Zone. For the more information about the artists and the complete program with times and venue addresses, see the Live Cinema website.